Why not spend a cosy festive holiday over Christmas or New Year with family and friends. The Highland Club offers the perfect setting for family gatherings. Take away the burden of entertaining by visiting our Boathouse Restaurant, nestling in this stunning location on the shores of Loch Ness. For every reservation over Christmas and New Year we offer a complimentary bottle of Champagne. 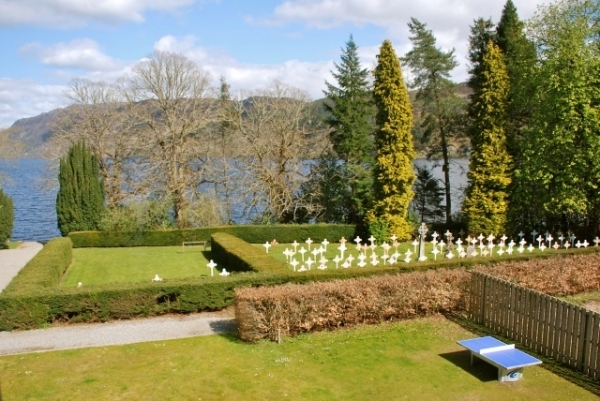 Luxury two bed apartment situated in The Monastery building of a converted Benedictine Monastery, set in 20 acres of private gardens on the shores of Loch Ness. In the heart of the Highlands, this sympathetic conversion is an ideal base for exploring all that Scotland has to offer. Whether you are searching for outdoor adventure, or simply just want to unwind, this is the place to do it. From white-water rafting to whisky trails and ceilidh evenings, you'll quickly find that a week is just not long enough! 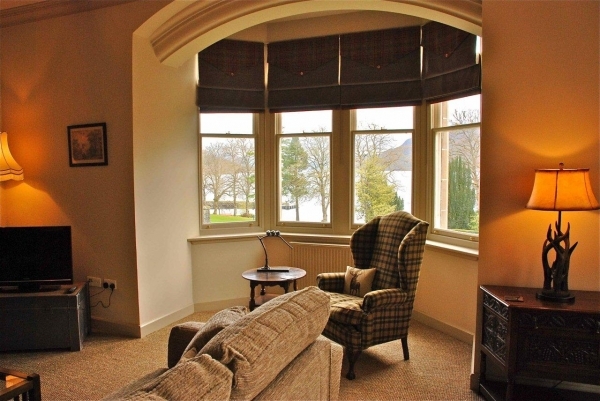 Struan apartment has wonderful views over Loch Ness and the Monastery gardens and it has been furnished to an exceptionally high standard. 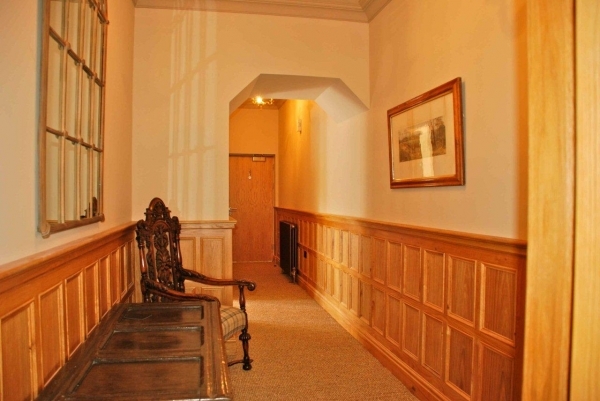 The entrance hall with its beautiful oak paneling is spacious and tastefully decorated. 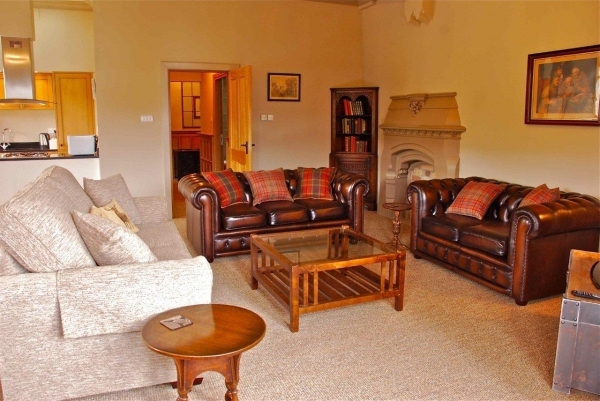 The beautiful open-plan lounge is furnished to a high standard and gives the feel of a traditional hunting lodge, and there are an abundance of original features. 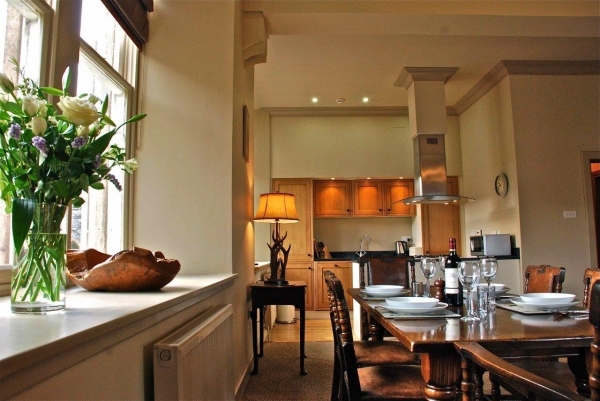 The high ceilings and large windows give this property a light and spacious feel. 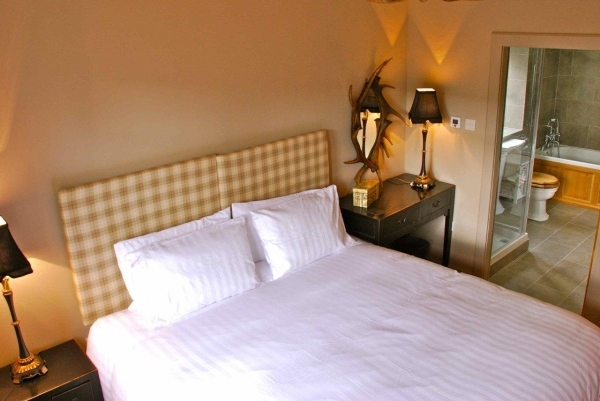 All rooms are well proportioned and decorated with exceptional attention to detail. 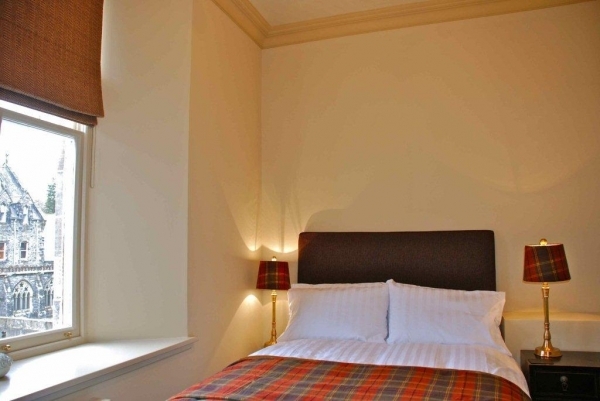 The two bedrooms are the epitome of comfort and style with sumptuous soft furnishings; the beds in the master bedroom can be arranged as a super-king or twin. The two bathrooms are high specification with Hansgrohe fittings, slate tiles and under floor heating, providing extra comfort. For group reservations this property is in close proximity to Fraser, Abbott's Rest and Gruinyard’s apartments. Our property manager will meet you on arrival and show you to your accommodation. BEDROOM 1: Double Bedroom, west facing with en-suite with shower cubicle & bath. This room can be arranged as a king-size or twin. 19" TV & DVD player. BEDROOM 2: Double bedroom with pretty views over the Cloister gardens. BATHROOMS: 2 bathrooms with bath and shower cubicle. 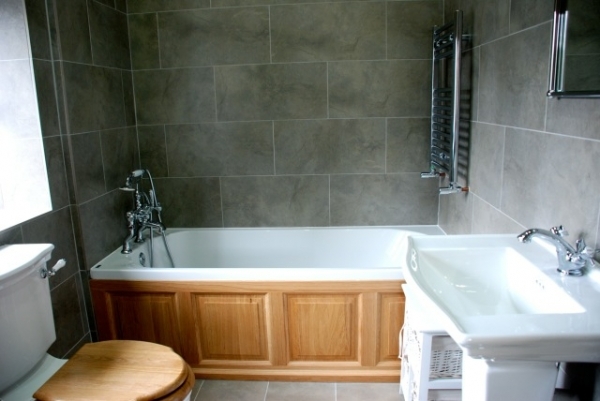 High specification Hansgrohe fittings with power shower, large heated towel rail and slate tiles to the walls and floors, under floor heating. Luxury complimentary toiletries are provided. KITCHEN: Oak kitchen cabinets, Cooker, Hob, Microwave, Fridge, Freezer, Dishwasher, Washing Machine, Iron. The kitchen is fitted out to a very high specification and finished with granite work tops. GENERAL: Central Heating, High quality linen supplied. A welcome pack is provided on arrival. Double sofa bed in lounge. DINING: Seating for 6. 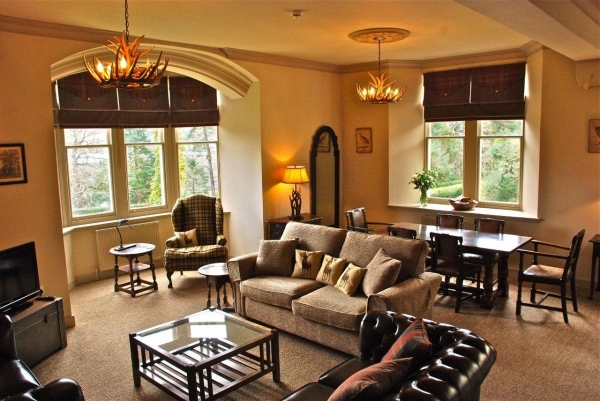 The dining area is bright and open-plan with views out over Loch Ness and the Monastery gardens. ENTERTAINMENT: WiFi in the apartment, Satellite Free View TV, Stereo (iPod docking), Board Games, Books and Outdoor Equipment. 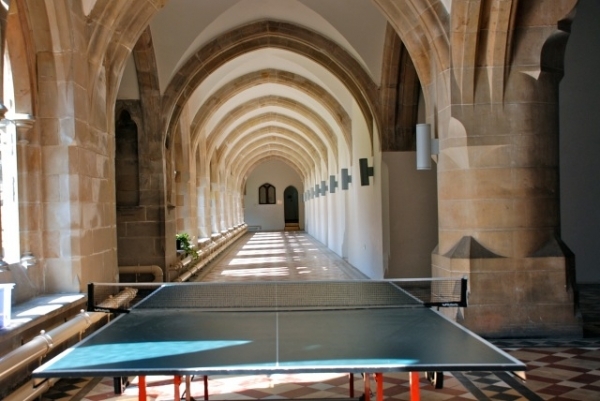 COMMUNAL FACILITIES: Pool, Sauna & Steam Room, The Highland Club Lounge with snooker and WIFI, Gym, Extensive Gardens (20 acres), BBQ, Table Tennis (indoor & outdoor), Tennis Court, Croquet, Boules Court. SPORTS EQUIPMENT: 4 Tennis rackets plus balls, 4 Badminton rackets plus shuttlecocks, Football.